You are what you eat — and your brain is no exception. Your gut has a direct connection to the brain along the gut-to-brain axis. Anything that passes through the gut goes into bloodstream, and ultimately goes to the brain. A healthy gut, therefore, positively impacts the brain. Unfortunately, the inverse is also true: poor gut health can lead to brain issues. To improve your brain’s health, start first with prebiotics — ingredients that induce the growth of beneficial microorganisms in your gut. You’ll also want to consume foods packed with probiotics. The combination of prebiotics and probiotics can help get your gut microbiome into a healthy balance, with a good diversity of intestinal bacteria. When you have plenty of good bacteria, the harmful ones get crowded out and have a much harder time making you sick. Your digestion also improves, because your ability to absorb macronutrients and micronutrients is better when your beneficial bacteria are diverse and balanced. To incorporate prebiotics into your diet, choose plant-based foods that contain prebiotic fibers such as asparagus, cabbage, garlic, Jerusalem artichokes, onions, unripe bananas, cashews, pistachios, lentils, and chickpeas. For probiotics, choose cultured vegetables like kimchi and sauerkraut, coconut kefir, miso, pickles, and apple cider vinegar. Other foods that positively impact your gut health include: avocado, colorful vegetables, wild salmon, blueberries, walnuts, and turmeric. 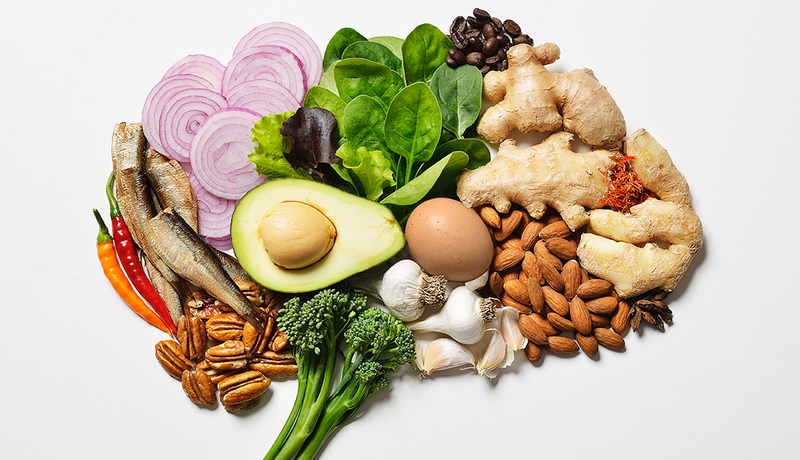 By combining a brain-healthy diet with nutritional supplements, you’ll provide your brain with long-lasting fuel for optimum levels of functioning. • Oligonol. Derived from lychee fruit that helps with post-meal glucose stabilization, oligonol also has proven effects on decreasing inflammation and oxidative stress, therefore preventing damage to the brain. • Exogenous ketone salts. Ketone bodies, ingested in either mineral or ester forms, help break down fat for energy. Beta-hydroxybutyrate, found in ketone salts, signals cells to release glutathione — a master antioxidant that positively impacts the brain. • Medium-chain triglycerides (MCTs). A type of fat molecule found in coconut oil, MCTs are extremely beneficial for energy and fat-burning. They also positively impact brain-derived neurotrophic factor (BDNF), which works to support the brain’s existing neurons, encourages new neuron and synapse growth, reduces neurodegeneration risk, and makes neuronal synapses and communication more efficient. • Fish oil and omega-3 fatty acids (DHA). Omega-3s improve cell membrane health and act as a neuroprotective agent. • Magnesium L-threonate. This supplement enhances synaptic density and can decrease brain aging by nine to 14 years.